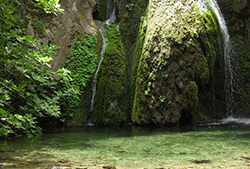 Lassithi occupies the far-eastern part of Crete and it is divided into eight municipalities. 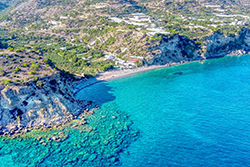 It has a variable and contrasting landscaped, home to endless, sandy beaches and fertile plains, embraced by three seas, the Cretan Sea in the north, the Libyan Sea in the South and the Carpathian Sea in the west. Its mild, purely Mediterranean climate is without abrupt fluctuations and pleasant year round. 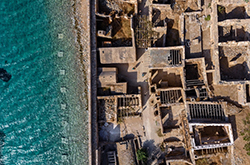 The prefecture is steeped in ruins of ancient cities, settlements and buildings. There are quite a few spots worth visiting in Lassithi, like the Archaeological sites of Gournia and Zakros, the Diktaion Andron on Kikti mountain, the 15th century Toplou Monastery and the islet of Spinaloga with its famous Venetian castle. The cosmopolitan air of the island blows strong in Elounda, while other - no less beautiful - cities, towns and villages, like Ierapetra, Aghios Nikolaos (capital of the Prefecture), Sitia, Neapoli and Makrigialos, complete the diverse picture of this corner of Crete. Unique to all of Greece, and a "must see" is the forest of Vai, an area filled with palm trees. The plateau of Lassithi is one of the most beautiful areas in Crete. It is a green, fertile valley (817 m. altitude), covering an extension of 25,000 sq. km. full of cultivation of potatoes, garden and fruit products and almond - trees. The scenery's beauty is completed with the 10,000 windmills, which are scattered here for the area's watering. Lassithi has a rich spiritual tradition, perpetuated from generation to generation. An ancient tradition, the tradition of popular "festivities" or family gatherings adds a particular vivid colour in the local way of living, although inevitably affected by modern lifestyle. Cretan dances of unparalleled grace, vivacity and gallantry, rouse people of all ages during social gatherings or festivities. People in Lassithi love to celebrate. Religious and cultural festivities are held throughout the year, some of them with ancient origins, others steeped in history and tradition. 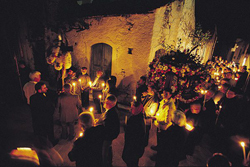 Easter is the most important religious festival, celebrated with processions and religious services. During the summer many local festivals with traditional atmosphere are celebrated in picturesque villages, a perfect scene to observe the rural reality of the prefecture and an ideal chance to taste dishes of the local gastronomy. Population totals approximately 70,000 and the principal occupations are farming and stock-breeding. Known for the generosity of their spirit, the locals like visitors, they are pleasant, graceful and hospitable. As their glorious and turbulent history indicates, they are driven by a powerful desire for freedom and independence, which is reflected in every expression of daily life. Their intense character combined with a strong sense of family loyalty, often leads them to actions that may be viewed as extreme by outsiders, manifested in generations-long "vendettas" between families. Customs and traditions are kept alive. Many still wear the traditional costumes, sing traditional Cretan songs and dance local dances. In the domain of arts, especially in the domain of woodcarving, many craftsmen have become famous especially in church ornamentation, most of them well preserved until now, unique for their inspiration and fine technique. Lassithi has always shown a remarkable production of home handicraft, resulting in fine works of art with exquisite decorations. Being the most eastern part of Crete and at the same time the southernmost part of Europe, Lassithi presents a particular interest, featuring local indigenous species of plants (not to be found in other parts of the island), as well as plants that can only be met in Asia or in Africa. Luxuriant vegetation is present at all times in the plains and on the mountain slopes, even during the summer. Selakano with its pine forest, Katharo with its cypress forest, Selena with its "Azilakos", the palm-tree forest of Vai and the plateau of Lassithi are really unique. 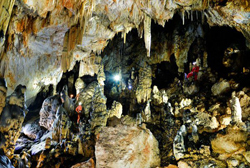 Tens of gorges, plateaus and more than 1300 caverns embrace the indigenous beauties of the fauna and flora of eastern Crete. 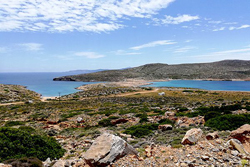 While most of the 2000 indigenous plant species of Crete are found in Lassithi. A superb specimen of a healthy Mediterranean diet based on the "blessed" olive oil, the local cuisine is accompanied by a selection of wines famed since classical times. In the coffee shops visitors are served "custom-made" coffee or successive rounds of "raki", a local spirit. At the tavernas visitors will enjoy "dakos" local bread, myzethropita (cheese pie), chochlious bourbouristous (fried escargot) and sweet smelling wines. The market of Agios Nikolaos has a wide variety of local products such as cheese, wine, raki and tsipouro. At the beautiful village of Agia Fotia, the locals produce fresh honey of excellent quality. At the local shops, one can purchase beautiful embroideries, woven-fabrics and ceramics. At Kritsas, the local women make lovely, detailed embroideries. At Agios Nikolaos, one should buy wood-curved and woven objects, as well as jewellery. Crete's rich tradition in hand-woven fabrics, embroideries, wood-carvings and jewellery-shopping is a real temptation to the visitor. Exambles, old and new, can be found in the marketplace of the cities and also in the villages, where visitors may have a chance to see these age-old craft being practiced.